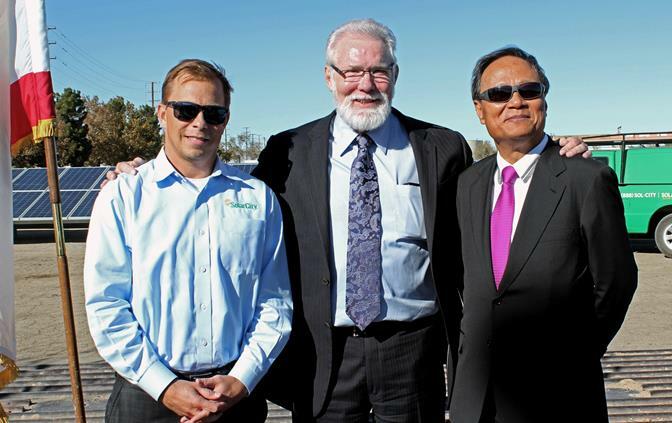 LANCASTER – US Topco Energy, the City of Lancaster and SolarCity are collaborating to bring a four-megawatt, 16 acre “solar farm” to Lancaster, city officials announced this week. The project, consisting of 14,000 ground-mounted solar panels installed on vacant city land, is expected to generate enough clean, renewable energy to annually power more than 550 homes. SolarCity will design, build, own and maintain this new system, which is currently under construction. The project has been developed by US Topco and the city as phase one of an ambitious plan expected to bring a total of 200 megawatts of solar to Lancaster. Under Southern California Edison’s CREST feed-in tariff program, the utility will pay SolarCity for the solar electricity the farm generates, which will feed directly into the local utility grid, reducing the City’s carbon footprint. This solar project culminates the effort launched in 2010 with SolarCity which is already bringing solar power to hundreds of homeowners, schools and churches across the city; as well as to Lancaster City Hall, the Lancaster Performing Arts Center, and the City’s minor league baseball stadium. Earlier this year, Lancaster became the first city in the nation to require housing developers to install solar energy with every new home built. More local projects with US Topco are planned. 13 comments for "Lancaster partners with US Topco Energy and SolarCity to build solar facility"
To apply for any job at the solar farms they use a temp agency out of san diego. A majority of the jobs are filled and all from out of town employees.There is nothing local about any of these solar farms, its a shame. My Electric bill still looks the same and in fact it has gotten more expensive. We need to pass the savings on to Lancaster Residents. The one on avenue M has a big sign up saying Rutan Solar. That’s a different project and on the Palmdale side of the street. The one that they are building with Solar City is near the new Hospital on Ave I. It’s on Avenue H-8 Between 3rd Street and Division, near my home. Unless they have more than one project, this one looks like it’s going around the little High School. -Parris’s overwhelming desire to be photographed? Will the employees be paid $1.50 an hour with a 50cent living stipend???? Joe. Of course they won’t pay worker’s $1.50 an hour! What an insult. Lancaster will pay them a very generous $2.50 per hour and a $40 stipend. Can we also focus on being ghetto free? Yeah, just start voting out the “Party of No” in 2014 so we can pass some jobs bills instead of trying to take down the ACA 42 times. Then people can go back to work, and nothing fixes poverty like higher minimum wages and jobs for everyone. Joe > Since this work is being done by Solar City, they already have a presence here in the Antelope Valley, and have for quite some time. My guess is they are tapping into their existing pool of employees who already work here in the Antelope Valley. The scale of this project shouldn’t warrant the hiring of additional workers. Anyone else notice how there is little to no advertising for local workers on these solar jobs, and Rex’s BYD manufacturers? 14000 panels only powers 550 homes? hasn’t anybody noticed those massive dust storms, that have caused deaths, start from the solar fields out on the north west side of the valley? did it bother anyone that they dug up a good chunk of the poppy fields to put in a solar field?